How Do You Spell EATER? Correct spelling for the English word "eater" is [ˈiːtə], [ˈiːtə], [ˈiː_t_ə]] (IPA phonetic alphabet). 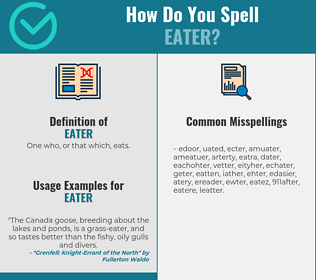 Below is the list of 437 misspellings for the word "eater". One who, or that which, eats.